Google has finally released the presentation app. You can only import Microsoft PowerPoint files that have less than 10 MB and export a presentation as an HTML file with images. You can change the theme or the layout of a slide, but there aren't too many options available. There's also an option to create the first slide of a presentation from a document, but it only works for short documents. The presentation can be shared with everyone and any viewer can follow the presenter or take control of the presentation. The preview includes a group chat feature based on Google Talk's gadget that shows the active collaborators and viewers. If all the viewers click on "View presentation", they can watch the presentation at the same time. To see a scrollable overview of all the slides in a presentation, check the "Printable view". It's also a way to search inside a presentation, but you can't go to a certain slide. "As with its other applications, Google intends to add additional features, like customization for mobile screens and the ability to integrate files stored on remote servers," mentions InformationWeek. But for now, Google's new presentation app is pretty average: it doesn't have options for embedding, you can't export the presentation as a PowerPoint file, there's no option for adding transitions, notes, audio files or content from the web. Google Presentations' strongest point is collaboration, but it delivers far less than other online presentation apps. 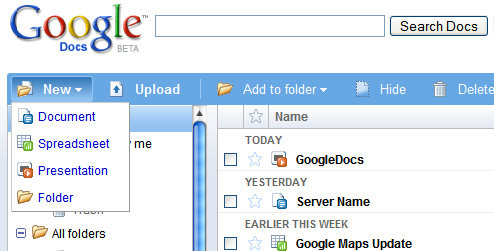 "Presentations are a natural addition for Google Docs , as they are usually created with the intention of being shared. Web-based, collaborative presentations offer users much-needed relief from manually managing and compiling group members' input in separate attachments, and they make it possible for multiple users to view a set of slides while a moderator controls the presentation. Users will see that these features are still in simple, early stages; the Google Docs team is making them available today in response to strong user demand for presentation-sharing, and updates and improvements will continue to roll out over the coming months," explains Google. It's also worth mentioning that the new member of the Google Docs family doesn't have a name and that Google Docs & Spreadsheets transformed into Google Docs. Update: Here's an example of published presentation. So they added it. It don't have all the features everybody would want, but probably that will be fixed soon. I'm happy enough that imported ppt looked very similar to original. Unfortunately odp is not yet supported. I assume one of the first online presentations that needs to utilize this application is Google Edu But since most of them use odp format, it could be a while before this one is actually utilized. Also support needs to be added for video/presentation view. By looking at the code, I think I found out the reason it took so long to launch Presently. Those who tested it had to vote if it's ready. "Beta Meter: Is Presently ready for launch?" Writely had a similar option before it was acquired by Google. I tried, I believe Google will have to improve a lot to get where Google wants to be. Your post says that Presently is not the official name, but it is all over the code. You got that right from the start! Good points! I think odp would be a smart move. They don't call it "Office" because they do not want to upset Microsoft. Ha! Can you believe that? Sounds ridiculous, but it is true! It's very handy and practical for drafting presentations I find. The built-in chat is great too, but home to the biggest let-down for me - it doesn't save the chat in your Gmail account. I'd love to keep a word-for-word agenda from what people discussed about the presentation. kw***: Wow. An actual audience. 4:45 PM What do you like? and that it's very easy to do. 2) being able to using timing with presentations so that they will run on auto-pilot. 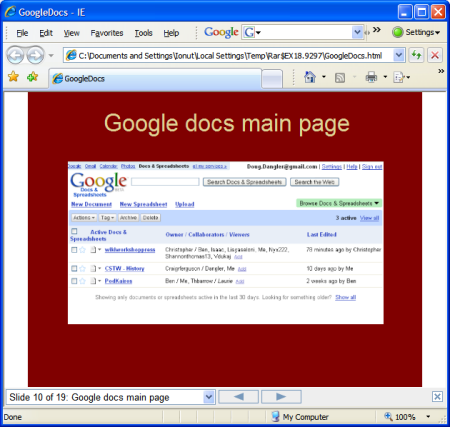 Is there any way to embed a google presentation into a wikispaces page? Really looking for ODP support otherwise will not be able to use the Presentation part of it. Any timelines on when will that support be enabled ?